I always thought Shangri La was a mythical lost paradise, a place of peace and tranquillity. But it’s not, not according to NextGen Gaming. They’ve taken the idea from James Hilton’s 1933 novel Lost Horizon and spun it for 20p slots players. But we’re intrigued. Is a game with multiple free spins, random features and a gamble option capable of bringing the ultimate win? The Shangri La slot is about to reveal itself. There’s something magical about Shangri La from NextGen Gaming, but it’s not the place we’re led to believe. Yes a place of beauty, we see the pretty girl and there are flowers with running water. But just remember one thing, you’re playing online slots to win money, or lose it. Which ever comes first? In this slot review, we’re going to look at what Shangri La can do for winning players. 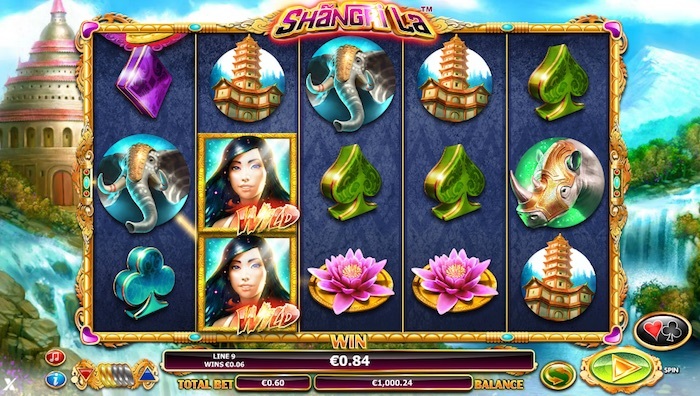 At 5 reels and with 15 pay lines, Shangri La is a new 20p slot from developer NextGen Gaming. I’ve read lots of reviews about the games multiple features and free spins, so I’ll be looking at those as well. The slots premise is Shangri La, it’s mystical, the game is good looking and it’s got a 96.63% RTP payout rate. Positives, it’s got lots of game play value for that 20p. Not so good, can you afford to wait for the features? Look at our case study. As for playing, you can hit the Shangri La demo at numerous UK casinos or play for real money. If it’s the latter, you can spin from 20p to £200. Take note, you get 15 pay lines of cover for that bet. It’s available to play on mobile, tablet and desktop platforms. Too many new slot reviews blow smoke. It’s all marketing nonsense. But actually, what makes a game good? Slots can be boring, and if you’re losing, they can be upsetting. At Slotsquad, I look for playability. It’s what you’re getting for that 20p, £2.00 or £200.00 betting stake. You’ll be pleased to know that Shangri La has playability. It’s got playability because there’s plenty that can happen. It’s also great to the play. Spins are consistent, animation is smooth and the graphics look first-rate. What’s more tempting is the Shangri La pay table itself, probably one of the most lucrative we’ve seen this year. Add random features to the base game and four bonuses behind the scenes. You begin to see the scale of this adventurous 20p slots game. At 96.63% pay out rate, it’s not surprising that UK slots players are seeking this one out. New casino games need attractive pay tables or we’re not playing, end of story. So what’s here? Open up the pay table and there’s plenty of charm, a beautiful girl, flowers, animals, you name it. It’s all things Shangri La. But what do the numbers say? Play for real money and you get 15 pay lines for the bet. So which symbols pay, and which symbols kick start the features. To be honest, they all pay. But some of those wins can be small to say the least. Card symbols won’t do much for your bankroll. Swords and flowers pay better, and animals pay more again. But the slots scatter (gold tiger fortune) can pay 3000 x your betting stake (coin value) for 5 in a row. If playing for 20p, that would be a coin value of 1p x 3000 = £30.00. If playing at £200 a spin, it would be a win of £30,000. The girl is the games wild and the gold tiger fortune is the Shangri-La slot scatter. Both symbols can lead to high-value wins and big wins via features. Sadly when I played the game (Slotsquad case study) I didn’t trigger any of the features. But there’s lots of payout power hiding in Shangri La. NextGen Gaming use a combination of random and activated bonus features. But does it work? It certainly sounds busy, and there are lots than can happen. However, you could need lots of 20p – £200 spins to see any of it. The girl wild symbol is the bulk of the random extras. Appearing on reels 2, 3 and 4 only, she doubles the payouts of win lines she generates. That’s not all. Wilds can be added to the reels at random, the three center reels can go completely wild or scatters can appear during spins. In all, there is lots of weight here for potential big wins. It’s not just random extras that help in Shangri-La; the latest NextGen Gaming slot is equipped with four bonus games above the base-game. That basically means you need to get three scatter symbols to exit the base game. There’s a nice payout for getting this but also a bonus wheel that determines which of the four bonuses you play. Free Games, Super Free Games, Chest Bonus and Trail Bonus are the four money makers that players will hope to see. The first two are effectively free spins, free games offering up to 16 free spins and super free spins up to 24. There’s stacked wilds and special wilds involved too so hitting them should be top of your wish list. The second two, chest and bonus features are ‘pick and hope to win big’ features. The treasure chest is exciting with up to 15 x your betting stake hidden in side. The trail is harder, with x spots effectively ending the game. The trail does however offer up to 100 x your betting stake. They don’t make it easy for us gamblers! Finally, if betting on slots for 20p or £200 wasn’t enough gambling? NextGen Gaming Shangri La offers more gambling with a gamble feature. I’m always wary of any systematic software addition such as this, however, if you’re not happy. You can try to double, or even quadruple your bonus winnings. Or! Lose everything trying. 20p slot games are safe bets if you don’t mind costing your hobby. But be warned, Shangri-La is high roller ready with some huge betting stakes. There are coin values of 1p to £10 (you have to play 20 lines), so bets can range from 20p to £200 a spin. Remember as well, you cover 15 pay lines for that 20 cost. Win lines pay times the coin value and not the spin cost, so don’t get confused. Shangri La has payout potential, but you could pay for it! As for the slots jackpot, there’s some high numbers in the pay table. 500 x your coin value and 3000 x your coin value are two key jackpots worth winning. Some new slot reviews and even casinos suggest you can win £100,000 playing this game, but I don’t see how that’s mathematically possible. That said, the payout rate (RTP) for Shangri-La is 96.63% and that’s stronger than 69% (approximately) of other games. It’s a great looking game with lots of value on the pay table. After seeing a roundup of the latest UK slots to play for 20p, this one ranks highly. There are lots of features in Shangri La, but like the mythical paradise itself, are we ever going to see them? It’s worth playing for the playability factor alone, and only because the ‘what ifs’ outweigh the ‘what if nots’. But who am I kidding; we’re gamblers in search of Shangri-La’s fortunes.